In the absence of ligand, PPARδ-RXR heterodimers bind to consensus PPAR DNA response elements (PPREs) and repress target gene expression by recruiting corepressors and associated repressive proteins including B cell lymphoma-6 (BCL-6) (top). Upon addition of PPARδ ligand (bottom left), PPARδ-RXR heterodimers undergo a conformational shift. This dismisses the corepressor complex, including BCL-6, in exchange for a complex of coactivator proteins and results in enhanced PPARδ target gene expression. BCL-6, an inflammatory suppressor protein, is thereby liberated to repress inflammatory gene expression. Genetic deletion of PPARδ also releases BCL-6 and repressor complexes from PPARδ target gene promoters, rendering BCL-6 available to suppress inflammation (bottom right). 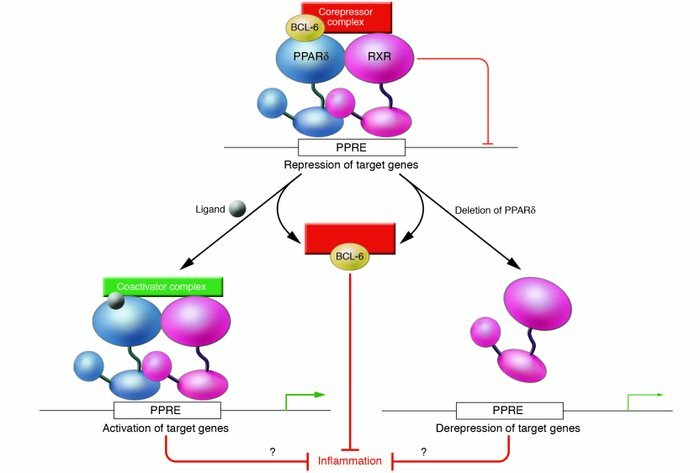 It is unknown whether the expression of direct PPARδ target genes (bottom left and right) has antiinflammatory effects. Target gene expression may occur either by ligand-induced transcriptional activation (large green arrow) or more modestly by transcriptional derepression (small green arrow).